While professing unhappiness about supporting the motion, the Liberals – confusingly – voted for it anyway, showing themselves a little too willing to narrow the range of political perspectives that Canada’s democracy can accommodate. The New Democrats and the Bloc Québécois both opposed the motion. In all, 229 MPs voted in favour while 51 voted against.It is not clear what (if any) the motion’s material consequences may be; it does not stipulate any specific legal penalties for those who support the BDS movement. But we know that in situations where the potential consequences of speaking out are uncertain, Canadians will be less likely to express themselves. Such vague government condemnation chills public discussion both of the BDS movement and the Israeli State more broadly. Canada’s continuum of allowable speech on this matter is not yet so narrow as in the United Kingdom, or in France, a nation whose government seems oddly amnesic about its die-hard devotion to free expression when those expressing controversial views ne sont pas Charlie. But in 2014 the Canadian government did add “national origin” to the types of “identifiable groups” covered by our hate speech laws; as we have observed elsewhere, it surely had critique of the Israeli State in mind when it did so. Sure enough, in the spring of 2015, the government implied in an email to CBC reporter Neil Macdonald that hate speech laws could be used to prosecute BDS supporters. Each time the government says or does something to push criticism of the Israeli State to the periphery of acceptability, the chill effect is intensified; citizens become a little more nervous that participation in BDS activities could leave them vulnerable to hate speech prosecution or attract government scrutiny of their political activities. (The surveillance of those engaged in peaceful opposition to the Enbridge Northern Gateway pipeline project presents an uncomfortable example this type of government scrutiny.) Insinuating to the public that it is better to be seen and not heard – on any issue, but especially on issues of great political significance – should never be the role of a truly democratic government. The House of Commons is entitled to determine its diplomatic relationship to the State of Israel. It is entitled to make its own decisions about what products it purchases and what investments it makes. The extent to which our formal state apparatus supports either BDS’s goals or its tactics should be the stuff of debate amongst our elected representatives. But individual Canadians must feel completely free to express themselves on matters of public importance, whether or not their views are supported by a majority of the Members of Parliament. Constitutional rights must come before foreign policy decisions. 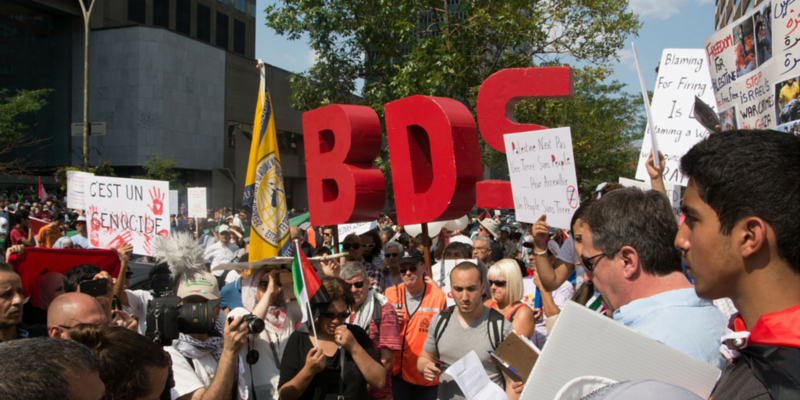 That BDS constitutes “the new face of anti-Semitism” – to quote a recent Memorandum of Understanding between the Canadian and Israeli governments – is taken as axiomatic by many of those who deny the BDS movement its right to exist. (It is worth noting that there are many who do not support BDS’s goals or tactics, but would still defend its right to operate unhindered by government condemnation.) It is this strategic blurring of the line between the conduct of the Israeli State and hate for Jewish people that gives rise to threats of hate speech prosecutions in Canada, and actual hate speech prosecutions elsewhere in the world. The BCCLA is unequivocally opposed to anti-Semitism and racism in all its forms. But charges of anti-Semitism cannot become a tool for silencing peaceful civil society opposition to the policies of a foreign government. Indeed, the Canadian government itself routinely responds to the actions of foreign governments with BDS-like tactics; it currently imposes its own sanctions on 22 of them without expressing any concern about promoting hate against Russians, Liberians or Iraqis. We continue to celebrate the role we played in fighting South African Apartheid – which involved, among other tactics, the 1985 imposition of a variety of economic and political sanctions, followed in 1986 by a ban on investment. That the Canadian government sees sanctions as a legitimate diplomatic tool in these cases, but condemns Canadians who even dare speak of sanctions against Israel, should raise our collective eyebrows. Our constitutional protections of free expression were designed to protect just this sort of controversial speech; universally inoffensive speech requires no such safeguarding. It is our belief that the range of perspectives welcomed into the public forum must be as broad as possible; actualizing the values contained in the Charter of Rights and Freedoms demands nothing less. We are fully supportive of the right of Canadians to support and promote – as well as condemn and critique – the BDS movement, and we insist that the government uphold the rights of its supporters and critics alike.